UC Santa Cruz iGEM team members posed with their poster at the iGEM Giant Jamboree in Boston, where they won a bronze medal. Left to right: Chris Lee, Jazel Hernandez, Dominic Schenone, Kevin Sweeney, and Renee Jocic. Renee Jocic, a senior biology major at UC Santa Cruz, has wanted to do undergraduate research since she was a freshman. Finding a spot in a professor's lab can be challenging, however, so Jocic created her own research experience. She co-founded a team of UCSC undergraduates to compete in an international synthetic biology competition. "Synthetic biology is the idea that you're engineering life," said Rolando Perez, a senior in biomolecular engineering and the other co-founder of the team. "You're harnessing nature to do things nature's never done before." The International Genetically Engineered Machine (iGEM) competition challenges students to use the techniques of molecular biology to build novel biological systems and operate them in living cells. The UC Santa Cruz team worked to engineer a microbe to produce biofuel from processed plant material. 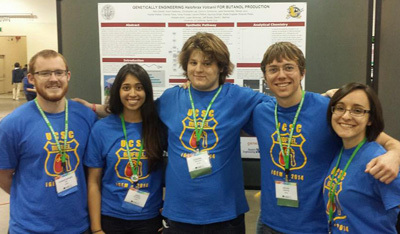 Six of the 14 team members, including Jocic, recently returned from Boston, where their project won a bronze medal in the 2014 iGEM competition (one of 59 bronze medals awarded). David Bernick, a lecturer and researcher in biomolecular engineering at UC Santa Cruz, served as the team's faculty mentor. Bernick said biofuels can play a role in slowing climate change as one component of a carbon-neutral energy system. In theory, the carbon dioxide released when biofuels are burned would be offset by the carbon dioxide absorbed during growth of the plants used as raw materials. The UCSC team's goal was to engineer a microbe to produce butanol, an alcohol that can be used as biofuel, from cellulose, the main component of plant cell walls. Other scientists have engineered bacteria to produce biofuels, because they grow quickly and their genetics are easily altered to create new functions. High salt concentrations can be used to strip cellulose from plant matter, but then any microbes used to convert the cellulose into biofuel would have to be able to tolerate high salt concentrations. The UCSC team decided to start with a microbe that already prefers growing in salty conditions--a type of archaean (a separate branch of life from bacteria). Archaeans are simple microbes that include inhabitants of some of the most extreme environments on Earth. The students worked with a species called Haloferax volcanii that lives in high salt environments. The students modified their archaean's genome to interrupt the metabolic pathways used to make long hydrocarbon chains on fats. They wanted to preemptively interrupt that pathway so that it only produces the 4-carbon chain needed to make butanol. The team identified seven genes that could be involved with the pathway they wanted to change. Last summer, they created two engineered microbes, each with a different one of those seven possibilities silenced. The researchers know their changes altered the proper pathway, but they haven't yet tested the microbes to see if either one accumulates butyrate, a precursor of the desired biofuel. Some of the team members are currently continuing to work on the project, Bernick said. He is currently creating a course to extend the iGEM experience to another group of 12 students each summer. The new course would be another way for undergraduates in biomolecular engineering to fulfill the capstone requirements for their degree. "One of the biggest limitations facing science majors is getting into a lab and having research experience," Bernick said. He hopes this new course will give more students an opportunity to work in a lab and design research. Bernick noted that the students were the core drivers of this project. Jocic and Perez approached him with the idea to form an iGEM team composed of students from a variety of majors and backgrounds. All the undergraduate researchers, faculty mentors, and graduate student advisors were unpaid volunteers. The team paid for their lab work and trip to Boston with crowd-funded donations, and also received support from the Baskin School of Engineering and the Division of Physical and Biological Sciences. "It's remarkable what happens when you have resources, an idea, and a group of dedicated students interested in digging in," Bernick said. "All of these students, in their own ways, are exceptional." The team included a group of humanities undergraduates who investigated ethical questions inherent to synthetic biology projects. Some of those questions included environmental safety should an engineered organism escape the lab, as well as larger questions about social responsibility for global energy use. Bioethicist Sandra Dreisbach, a lecturer in philosophy and biomolecular engineering departments, mentored these students. In addition to Jocic and Perez, other UC Santa Cruz students on the team included: Christopher Lee, Dominic Schenone, Stas Fridland, Saumya Singh, Maximilian Genetti, Kevin Josef Sweeney, Mary Lenore Pafford, Vinay Chaitanya Poodari, Kaylee Walker, Wade Dugdale, and Paige Welsh. The ethics group included UCSC undergraduates Breeann MacDonald, Manuel Avalos, and Matthew Waldron. Team member Jazel Hernandez currently attends Hartnell College in Salinas and plans to transfer to UC Santa Cruz in 2015. Graduate student advisors were Jeff Nivala, Hosein Amiri, Logan Mulroney, Charles Paine, and James Sutter.